I'm continuing with my series on paper piecing. Today I'll talk about books and patterns I recommend. You'll see a trend, mostly Carol Doak books and patterns. Carol is the queen of paper piecing and does a fantastic job of explaining how to paper piece and comes up with some great patterns. I'm not really a big fan of her fabric and color choices, but I look beyond that to the great patterns. There are so many other books and patterns out there that I can't cover them all. I'm only going to highlight a few that I find interesting. To view the first post on tools needed, click here. To start, I would highly recommend that if you're interested in paper piecing to join the Carol Doak Yahoo group. There's a link on the right rail of my blog to take you there. On Carol's site she posts tons of free patterns, including blocks of the month series, holiday patters, milestone blocks, etc. You can also learn tips and tricks from members and ask questions. It's free to join and you can get a lot of great patterns and advice on here. 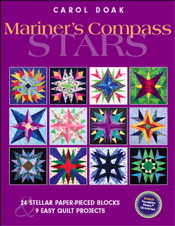 My favorite book right now is Carol Doak's Mariners Compass Stars book. 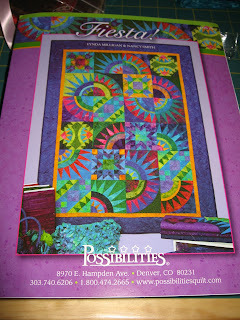 This is the book where I got the pattern for my Moonlit Sky quilt. 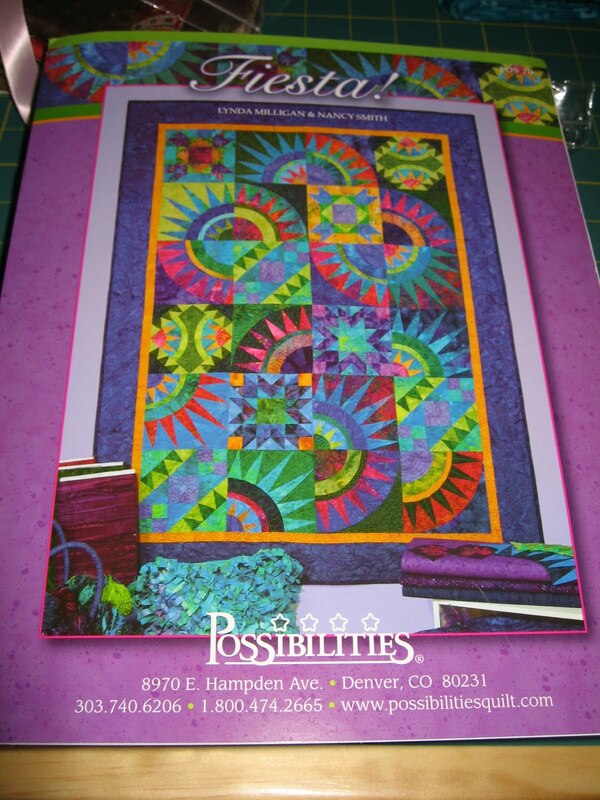 I like this book because it includes block patterns and shows you how to use the blocks in different quilt designs. The next book I recommend is also Carol's. It's 50 Fabulous Paper-Pieced Stars. I love this book because it has a lot of patterns that range in skill level. Some blocks might have as few as 6 pieces per section (there might be 8 per block) and others have as many as 15-20+. It's great for beginners and experts. 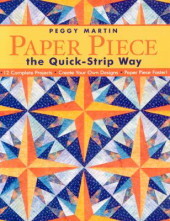 This book was the first book I got on Paper piecing and used to make my first paper pieced quilt. This is the quilt that stated it all. I made one block in an intro to paper piecing class and made eight more because I was hooked. Paper Piece the Quick-Strip Way is another good book. While I haven't made anything from this book yet, I've used this book as a reference to strip piece and save time. I don't follow the same technique, but I learned some tips and modified it to my preference. There are some great patterns in here as well. There are also many patterns out there for paper piecing. I am currently working on the Fiesta! pattern by Possibilities. 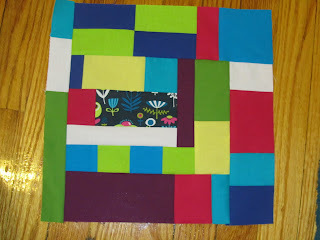 The paper piecing directions are not very good in this pattern, but the actual pattern's provided are a great way to try a New York Beauty quilt. There are a bunch of New York Beauty patterns out there using paper piecing, so look around to find a pattern that you like the best. Google - Google is your friend when it comes to paper piecing patterns. There are a TON of great paper piecing patterns out on the world wide web for free. If you're looking for a free leaf pattern, just search for it. I have found so many awesome patterns just by doing a search. I've been working on the Storm at Sea quilt for my parents lately. I'm paper piecing the whole thing. It takes a bit longer, but I get much better accuracy doing it this way. I'm sure I'll be posting a lot more updates to this quilt as I progress, so stay tuned. I finally managed to get a picture of Meagan's bee block before I sent it out to her. She sent a bunch of solids and a few prints. I decided to use just one print and the rest solids. This is the end of the bee that I'm participating in right now. I've got so much going on that I'm going to hold off in participating in another bee for a little while. 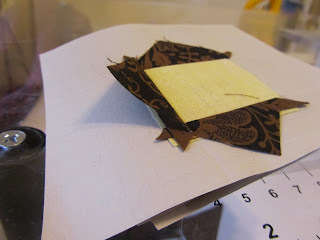 Recently I've had a lot of questions emailed to me about paper piecing since I tend to do a lot of it. I absolutely love paper piecing and hope to share some of the tips and tricks with you over the next few months. If you have additional questions, feel free to ask them in the comments and I'll try to address them as I talk more about paper piecing. The most important tool is the fantastic Add a Quarter or Add and Eighth. This is the one tool that you must invest in to paper piece. I only use the Add a Quarter. It's not that expensive. It comes in three sizes, the 6" the 12" and the 18". I have both the 6"and 12" and use both all the time. I tend to use the 12" more often, so if you're going to invest in just one to start, I would recommend the 12" ruler. After a quick search, I saw rulers online ranging in price from $5 - $9, so it's not very expensive. Besides my rotary cutter, mats, and basic rulers, this is probably the most used notion that I have. To help use the Add a Quarter/Eighth I recommend either a piece of cardstock or thin plastic such as template plastic with a straight edge. You'll use this to help crease your paper and line up the add a quarter/eighth to. 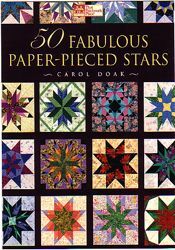 Carol Doak's Foundation Paper is something that I could not live without when it comes to paper piecing. It's thin paper that feed through any printer (that I've ever tried) so that you can print out your foundation designs onto it to piece with. The paper is thinner than your traditional printer paper, which makes it less bulky to piece with. I have used regular printer paper to paper piece with and have had success, but given the option, I would pick this paper every time. It comes in a package of 100 sheets for about $10. Whenever I see this on sale I will always stock up. Now, for those of you who have read my blog for a while know that I'm not one to talk negative about a product, but there is one product I would not recommend for paper piecing - June Taylor Perfect Piecing Block Foundation Sheets. I have found these extremely difficult to work with. The paper is very difficult to tear away, and if you attempt to leave it it (since it's not actually paper) it leaves the project VERY stiff. Sure this would work for a bag, but I would not recommend it for a quilt. A good Iron - This is essential to getting crisp seams and accuracy. Some people just finger press, but I find that in order to be as accurate as possible, you MUST iron. I recommend using a dry iron for paper piecing. One tip - if you start to see ink from your pattern on your ironing board, turn the temperature down on your iron. Yes, it's part of the basic sewing tool list, but I wanted to include this on here to emphasize how important I believe this is. Flat Head Pins - I will generally use these when starting a block and when using larger pieces. Everyone has a different view on pinning in general and when paper piecing. 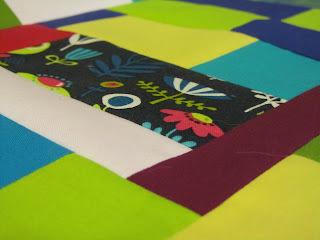 I use pins to hold the first block in place and when sewing on a piece generally larger than 4". Other than that, I don't really pin. This is one that I recommend trying both ways and seeing what you prefer. 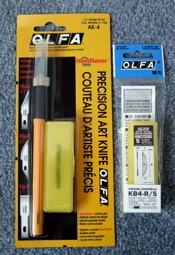 A flat blade knife/cutter such as OLFA Precision Art Knife is essential for removing a mis-sewn piece. You really can't use a seam ripper with paper piecing, otherwise you will tear the paper and distort the pattern. A knife like this helps to remove the piece that you need to remove without tearing the paper. This one sells for about $15-20 regular price, but I'm sure you could find it on sale for less. Gingher has a seam ripper that I know others have used that is blade like instead of the standard two pronged seam ripper for about $30 as well. I haven't use that, so I can't testify to how it works, but I just wanted to put it out there. OPTIONAL - Spray Starch is something that many people like to use when paper piecing. I only use it occasionally and wouldn't consider it a must have, but some do. It's really up to you. Try it both ways and see what you think. OPTIONAL - Curved Snips is a tool that some recommend to help cut the extra threads. I've never used these and have been just fine. To use these, tug the top thread up a bit and snip real close to the thread to cut the top and bottom threads at the same time. Honestly, I just use my small Gingher snips for this the same way and it works just fine. I've even used larger scissors too. Others, swear by this tool. You can get some for $5-15, so if you want to give it a try it won't cost you that much. Really, you should be able to get started with paper piecing for relatively little money. Find some good sales and you're golden.